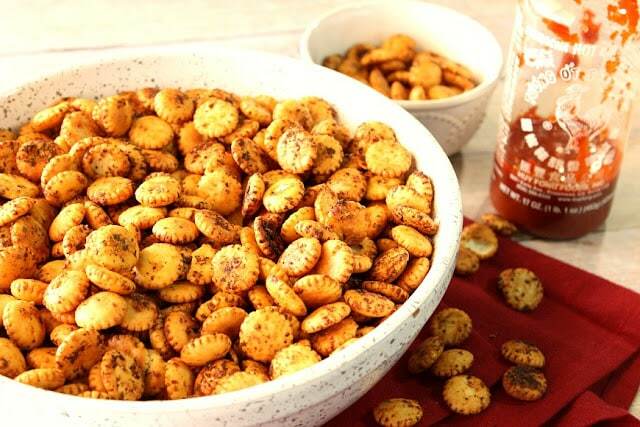 Sriracha Firecracker Cracker Snackers pack a whole lot of punch into an itty-bitty cracker. BAM! These hot and sweet Sriracha firecracker snackers will be a hit at your next tailgating event or your next party. They’re incredibly easy to make and take only a handful of ingredients that you probably already have in your pantry and fridge. 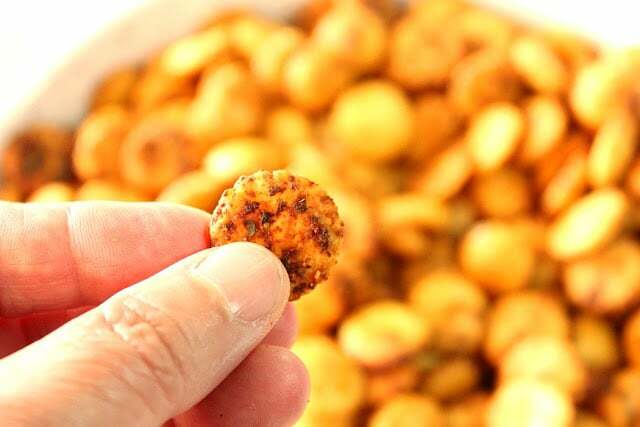 **Please Note – The printable recipe card with detailed instructions, complete ingredient measurements, and nutritional information for making Sriracha Firecracker Snackers is available near the end of this post. After he gets home from work, my husband likes a little something crunchy to munch on to take the edge off before dinner. I made these Sriracha Firecracker Cracker Snackers with him in mind, and he absolutely loves them. 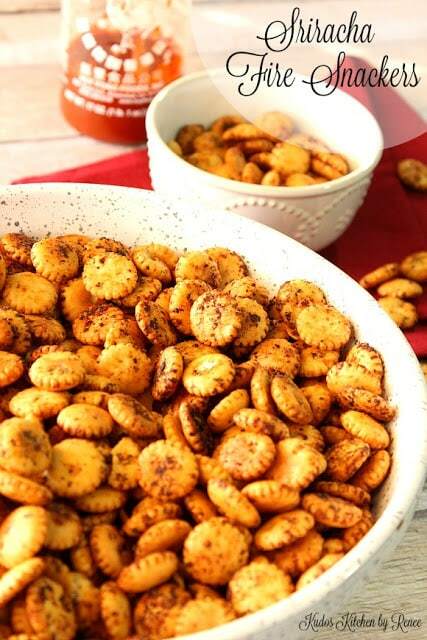 Because these snacker crackers have a bit of sweet (thanks to the honey) along with the heat (hello sriracha), these little cruncher munchers are completely addicting making them the perfect accompaniment for some nice cold beer (or two) while watching your favorite team. Winning!! Mix together the butter, olive oil, sriracha, and honey. Heat to melt the butter and whisk to combine. Pour the heated butter mixture over the oyster crackers in a very large bowl. Stir or toss well to coat. Add the garlic powder, basil, and oregano. Add the freshly grated Parmesan cheese to the crackers and stir well to coat. Spread the cracker out onto two baking sheets and bake for 7 – 10 minutes, stirring once. How can one little cracker pack so much punch? 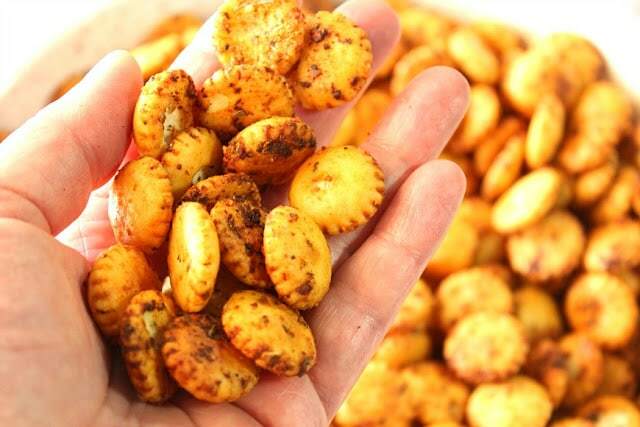 You’ll have to make these Sriracha Firecracker Snackers and find out for yourself…Go on…make them now…I wait. It will only take you 20 minutes. Below is the printable recipe card for today’s Sriracha Firecracker Cracker Snackers. In a small microwave-safe bowl, heat the butter, oil, sriracha, and honey. Whisk to combine. Add the oyster crackers to a large bowl and pour the butter mixture over the top of the crackers. Stir well or toss to coat. Add the basil, oregano, garlic powder, and Parmesan cheese to the crackers and stir well (or toss) to evenly coat. 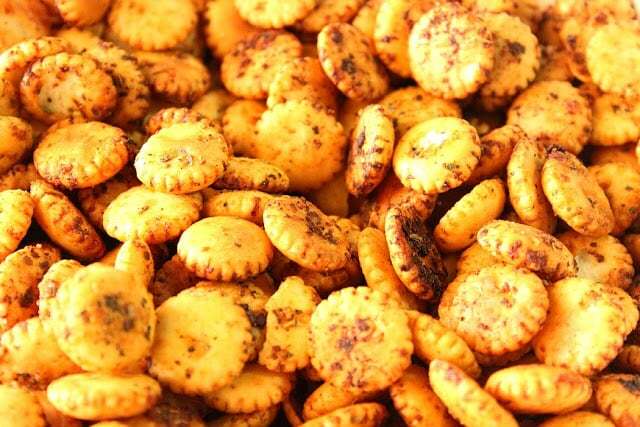 Divide and spread the crackers onto two baking sheets and bake in a preheated oven for 7 - 10 minutes, stirring once. Remove the crackers and cool completely. Store in a covered dish for up to 2 weeks. These would be great to serve along with a bowl of soup or chili. 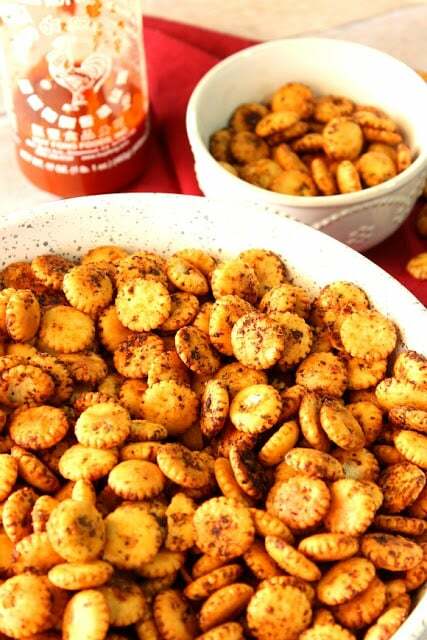 I sincerely hope you’ve enjoyed today’s recipe for Sriracha Firecracker Cracker Snackers as much as I’ve enjoyed bringing it to you! I just know you’re going to love them as much as we do! We love spicy here, and this is genius! Sometimes a nice, light snack before dinner is key. I've been seeing different varieties of these firecrackers all over Pinterest for a while now and they all look delicious! But I especially like your combination of seasonings, Renee. A little sweet, a little heat, a little cheese, and some of my favorite herbs. Yummy! I love pop in your mouth snacks like this! What a fun and tasty way to dress up oyster crackers! They look so delicious! Such a great idea. 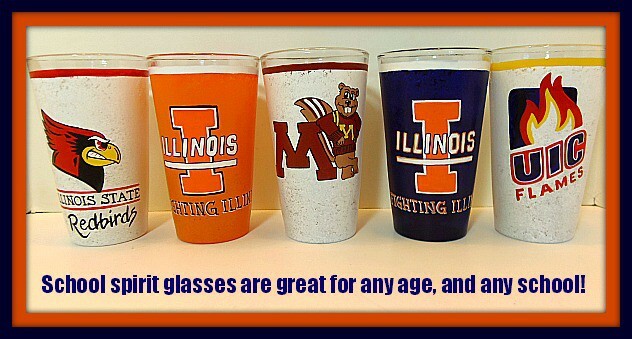 I bet this are awesome! Love anything spicy. Loving this! Sriracha on anything and I am a huge fan! Yum!! Crackers like this are one of our favorite gameday recipes! Look SO GOOD! I would have a problem not eating all of these! love the siriacha! 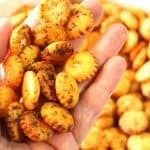 These remind me of the snack crackers my mom and I use to make when I was little but I am all about this sweet and spicy version! Perfect game day snack! I love sriracha, can not wait to try! You’re going to go crazy for these, Noelle. Enjoy!! Glad you liked the flavor and I think it’s brilliant to use maple syrup next time if that’s what you like. Question for you, do you use a convection oven? I do not so I’m wondering if that may be the cause of the burned bottom. In any case, turning down the oven is a smart idea if that’s what works for you.